Hello summer… and hello corn! While I’ll take all the summer produce I can get, there’s always been a special place in my heart for fresh sweet corn. As a kid, I eagerly awaited its arrival at our local farmstand and as an adult, not much has changed. 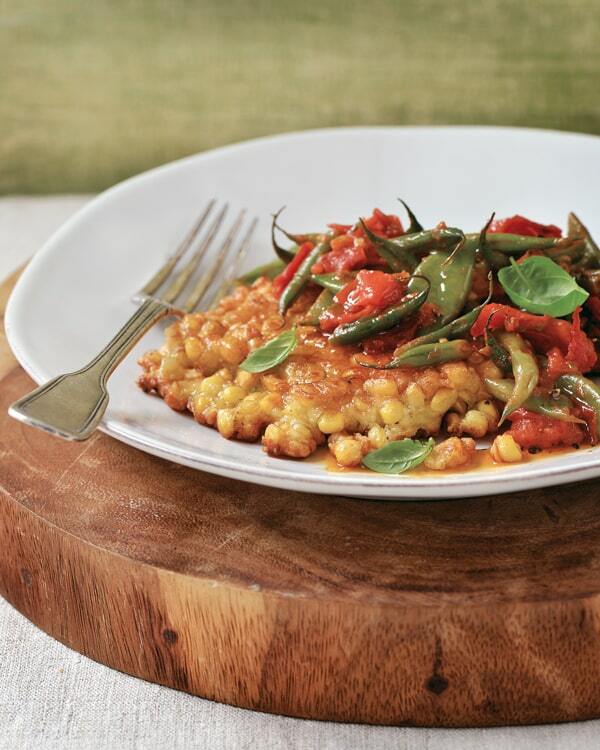 These crispy fritters from Cara Mangini’s The Vegetable Butcher are the perfect way to enjoy the best of summer’s bounty—in addition to sweet corn, there’s jalapeño pepper, string beans, and tomatoes in this recipe. This cookbook has been getting a lot of use in my kitchen lately and every recipe I’ve made has been a hit with the whole family (including my picky 1-year-old!). I love it because it’s packed with really creative vegetarian recipes—things like Shiitake Bacon and Shredded Brussels Sprouts Pizza and Celery Root Potpie—and I love it even more because, as the name suggests, it tells (and shows!) you how to “butcher” vegetables, from artichokes to zucchini. Ever wonder if there’s a better way to cut cauliflower into florets and de-kernel your corn? This is the book for you. It’s the kind of cookbook you’ll find yourself referencing again and again. Purchase The Vegetable Butcher: How to Select, Prep, Slice, Dice and Masterfully Cook Vegetables from Artichokes to Zucchini on Amazon.com. Heat the olive oil in a deep sauté pan over medium heat. Add three quarters of the garlic and cook, stirring often, until it just becomes fragrant, 30 to 60 seconds; do not let it brown. Add the jalapeño and tomato paste, stirring well to break up and incorporate the tomato paste. Turn the heat up to medium high, add the string beans, and cook, stirring to coat, for 1 minute. Add the tomatoes, 1/2 teaspoon of salt, and ¹/? teaspoon of pepper and cook, stirring, until the tomatoes begin to melt, 2 minutes. Add the wine and bring it to a boil. Turn the heat to medium low, add the thyme sprigs, and simmer until the beans are tender and the tomatoes have completely melted into a thick, chunky sauce (there should be no watery liquid remaining), 20 to 25 minutes. Remove the thyme sprigs. Stir in the butter if you wish and half of the basil. Adjust the salt and pepper to taste. Remove from the heat. Meanwhile, combine the corn kernels, remaining minced garlic, shallots, eggs, remaining teaspoon of salt, and remaining ¹/? teaspoon of pepper in a medium-size bowl. Stir well to incorporate the eggs, then stir in the flour until fully incorporated. The batter will be firm enough to hold together but loose enough to spread slightly in the pan. Place several paper towels on top of a wire cooling rack. Heat the canola oil in a large skillet over medium-high heat until it begins to shimmer, then reduce the heat to medium. Serve the fritters immediately, topped with hearty spoonfuls of the bean ragout, the remaining basil, and a generous drizzle of Balsamic Reduction. This sounds so amazingly yummy! I am going to have to try it out! Thanks for sharing!